Governor Takeshi Onaga announced a survey in temporarily restricted waters off the coast of Henoko at a press conference held at the prefectural government office on May 29. Okinawa Prefectural Government (OPG) will carry out a survey in the sea off Henoko between May 11 and 25, to investigate how corals have been damaged by concrete blocks installed by the Okinawa Defense Bureau. Currently, the Ministry of Defense is conducting preparation work in Henoko to build a replacement facility for U.S. Marine Corps Air Station Futenma in Ginowan. 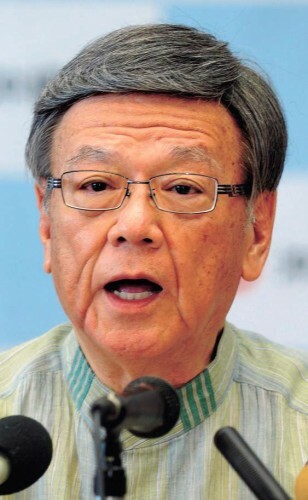 Okinawa Governor Takeshi Onaga announced the survey plan at a press conference held at the prefectural government office on April 29. The area for the investigation includes waters temporarily restricted by the U.S. military. The OPG has asked for permission to enter the restricted area but the central government and the U.S. military have refused it. This time, the governor showed his strong intention to push ahead with the investigation. The OPG conveyed the investigation plan to the Ministry of Foreign Affairs and the Okinawa Defense Bureau on April 29. At the press conference, the governor suggested that he would take a new countermeasure if the central government did not respond to his request. A survey, which was conducted by an unofficial group in February, revealed that corals were damaged by the preparation work for the construction of new base. The OPG also carried out an investigation into how the environment has been damaged off the coast of Henoko. However, the U.S. military refused the OPG’s team entry to the restricted areas, saying that their work would be hindered by the OPG’s investigation. The governments of Japan and the United States reaffirmed that the relocation of the Futenma base to Henoko is the only way forward at the U.S.-Japan Summit meeting and a meeting of the ministerial Japan-U.S. Security Consultative Committee (two-plus-two). Onaga said, referring to this confirmation by the two governments, “I feel strong indignation.” The governor also criticized the Government Leader for his verbal promise ‘U.S. military operations at the Futenma base will stop within five years.’ This promise was not included in the statement by Abe and President Barack Obama. Onaga said it was an empty promise to gain the approval of the landfill from the former Governor Hirokazu Nakaima. Onaga indicated his intention to visit the United States at the end of May at the earliest. He said he would attend the Okinawan people’s rally which is scheduled to be held on May 17.